Large flowing decks that face onto river and views of river from all downstaires areas internal and main bedroom total of 4bedrooms /1 downstaires & 3 upstaires/ 2 bathrooms 2 toilets + 1 very large bath also outside shower . 2 water craft,s supplied new 3 mt boat and ocean Surf ski all free used at your own risk . House timber built with beautiful rare Australian yellow teak floors lounge area and fine light coloured canadian timber boards for some of the walls . All set within 100 mts of the never closing Tree House Cafe for a coffee/ wine /beer or dinner until 8 am- 11 pm & with live entertainment on weekends as well as the Belongil Relax haven for a float or massage or the yoga tent to loosen up . The Belongil beach which is pet friendly is 200 mts away and southwards a 15 min walk to town centre. Fully interlinked smoke alarms and in all bedrooms & hallways/ lounge , 2 emerg lights in top & bottom hallways , with 2 fire exst/fire blanket kitch /Temp valve on all bathroom hot w taps complete/ security sensor triggered lighting all the way from carpark to house and beyond in the river garden making this a exstemely safety conscious property that is well lit and security safe .. Large off street parking area for 2 client cars + Security camera + security sensor lights to ward off unwanted intruders before they may venture into property , high front gates that are closed at night & sensor light guarded . . Noise pollution is a NO go and parties , gatherings etc other than those guests booked in is not permitted , max of 8 persons allowed on this property 24 hrs per day . Allowed but not inside house . Belongil Beach River House is exactly as the name suggests perfectly placed between river and sea. In fact if you don't want to you would not have to use your car the entire time you are there as it is a short and beautiful walk to Byron on dog friendly Belongil Beach and a great cafe next door. Alf is a wonderful host , nothing was too much trouble and he was always available for assistance if needed. The house is perfect for a family holiday with plenty of rooms and a great outdoor BBQ entertainment area on the river. A couple of things would have been helpful , a hair dryer and some insect spray to manage the odd mosquito , you are on a river so expect some insects. Alf kindly let me bring my dog and I have to say it was a perfect spot for a holiday with a furry friend. Even though we were somewhat unlucky with the weather we did manage a sunset sitting by the river and it was magic ...... just as the picture shows. Fantastic view of the Belongil River and super close to the beach! The house was nice and clean with plenty of space, would definitely recommend! Had an amazing time, we loved our stay here and couldn't believe how beautiful the house and property is. Perfect location to walk into town or just hang out on the deck and take the boats out onto the river. Plenty of space for our big family and the kitchen had everything needed - plus Alf was very helpful on all things in the area. Couldn't recommend it more! 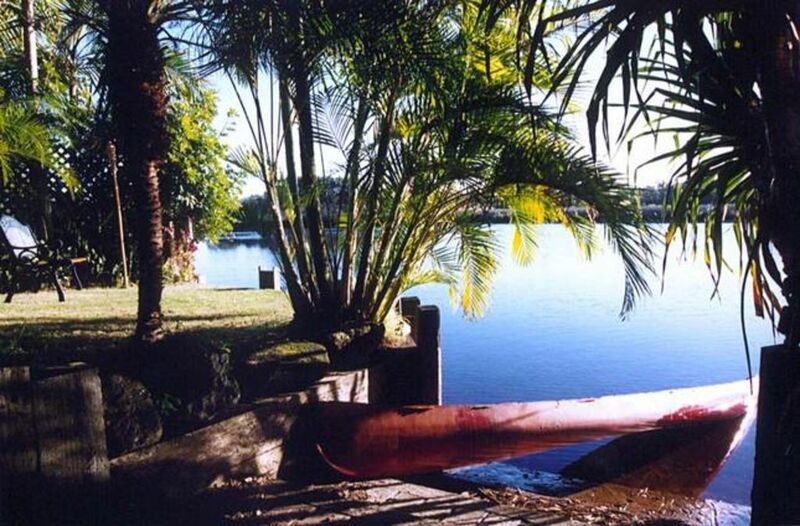 Very comfortable house hidden within a tropical oasis, right on the river bank. Convenient location, next door to cafe which is open from breakfast to late. Great stay for family with kids . Plenty of room , cosy and relaxing ! P/S the ducks miss you too . Glad you and your family had a relaxing holiday and enjoyed the provided boat and fishing , thankyou for your stay was a pleasure to have you all stay .